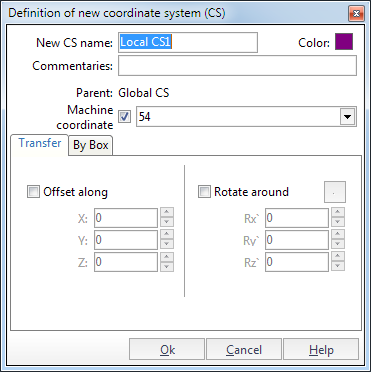 Window of creation new milling coordinate system opens by pressing the button on coordinate systems panel or by choosing of corresponding item in <Selection of a coordinate system creation method> menu. 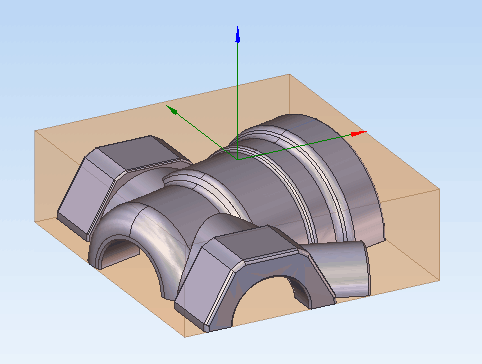 A milling coordinate system must be active at this moment. In this window is assigning <New CS name>, its <Color> and <Commentaries>. 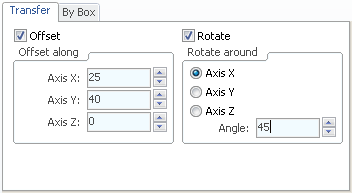 Check the <Machine coordinate system> checkbox and select appropriate coordinate system from the drop-down list to set the standard machine coordinate system. <Transfer> – all transformations are performed relative to the active coordinate system. A newly created system can be displaced and/or rotated relative to the parent coordinate system. <By Box> – a newly created system sets on external dimensions of group, that selected in <Box around> list. 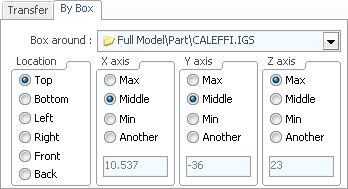 Select in <Location> how coordinate system will be positioned and give original point. Coordinates of point on corresponding axes can be selected as <Max>, <Middle> and <Min> relatively to the box of group or in absolute coordinates (<Another>). All changes will be previewed in graphic window immediately.